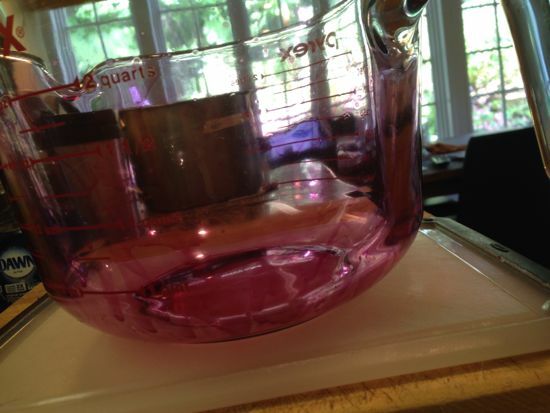 the steam juicer and concord grape juice. I am in love with my steam juicer. I got it last year and I did not rave enough, so I am raving again. It’s a tidy grape juice making tool. 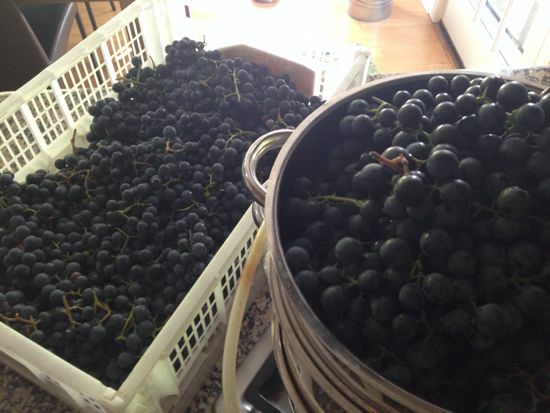 I have juiced 50 pounds of concord grapes and my hands are only vaguely stained. In years past, I would have had purple paws for a week or two. Beyond that, it’s so fast and efficient. It takes 2 hours from washing and packing the fruit to steaming and siphoning the juice. The yield has been much improved over the hanging bag method (an extra three quarts per 25 pound lug), and the juice is clear and not the least bit murky. Steam juicers are a little spendy, but just wait until you taste the juice. I’m going to do apples next and then some apple, cranberry, pear combos. 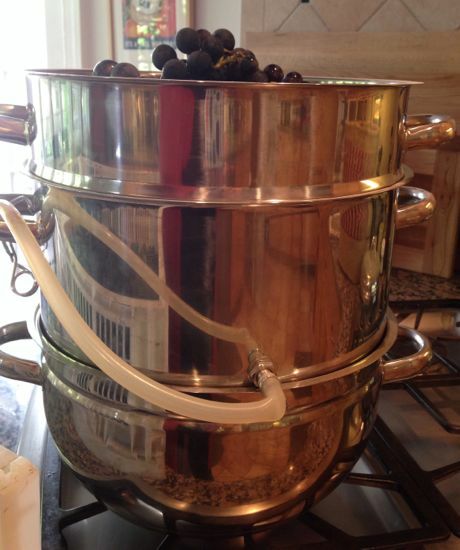 Pack the top of the steam juicer with as many grapes as will fit. There is no need to stem them. Fill the bottom of the steam juicer with 3 quarts of water. Assemble the steam juicer. Check that the siphon tube is pinched closed. Turn the heat to high until you hear the water begin to boil, then reduce to medium, so the water is simmering actively. The fruit will have collapsed like deflated balloons after about 90 minutes. Siphon off the juice into a large 10 to 12 quart stainless steel pot. Compost the grape skins. Fill the upper section of the juicer with more grapes, check the water level and add more if it has dropped more than one-third. Turn the heat to high and begin again. When all the juice has been steamed, reheat it and boil hard for five minutes. Ladle into jars, cap and process for five minutes in a boiling water bath. How do you prep apples for steaming the juice out? I don’t have access to grapes for this sort of thing. But apples are another story. To prep apples, just quarter or halve. No need to stem, core or anything. Some seeds may go through the holes, so strain the juice before canning. Have been gazing at this picture trying to figure out which one you have? is it the 8qt Victorio: http://www.amazon.com/Victorio-Kitchen-Products-VKP1140-Stainless/dp/B00B2CJNNU/ref=sr_1_2?ie=UTF8&qid=1412689856&sr=8-2&keywords=stainless+steel+steam+juicer ? I bought one last year and I can’t believe how wonderful they are! It has saved me so much time and energy compared the old way of mashing and using cheesecloth to strain. My husband and I picked a huge tote bag of free crabapples in our area and used this steamer. We canned several jars of juice and then had a hand mill which made awesome pink applesauce. We made beautiful crimson apple jelly and syrup for winter. I also spread applesauce on parchment paper and baked several hours on the lowest setting in our oven and made pure apple fruit leathers. His co-workers enjoyed these very much. It’s my best thing I bought ever -since I love making jams and jellies! I was ready about the steamer you use for grapes. Do you add any sugar to your juice? If this juice then concentrated so you add some water when being served? Thank you for responding. I apologize and should have proof read my message. When I went back and read what I had written I was terribly embarrassed. My new steamer will arrive tomorrow and I can’t wait to get started. Thank you for responding and advising that you do not add any sugar. Will I need to dilute the juice any when serving? That will be a matter of personal preference. We don’t dilute it at all. I sprinkle about 3/8 cup sugar to each batch of grapes and the taste is wonderful. I also mix part flavored water purchased at WalMart (Clear American white grape) to two parts canned grape juice when mixing for serving in a pitcher. This adds a little zest to the juice and everyone loves it. is placed in a saucepan so I can hold the handle and fill the jar. then it’s sealed with hot canning lids and rings. It’s clear and strong flavored, not pulpy at all. I learned of the Mehu Meiji from an Amish woman near where we live in Ohio. For many years now I have canned the juice the way she told me–wash and keep quart jars warm, then fill with juice leaving 1/4 inch head space, wipe top edge of jar, add lid and ring, hand tighten. ( While filling I set the jar in a large plastic measuring cup or saucepan because the jar gets so hot from the juice) You can add a tablespoon or so of sugar to the jar if you want a little more sweetness. After the lid is on, grasp the jar top with a jar tongs and swirl (jar is still sitting in my large measuring cup) to drive the air out of the small headspace. The lid will bulge slightly and then seal as it cools. No further water bath needed!! This process is a great time saver and yields well sealed jars. 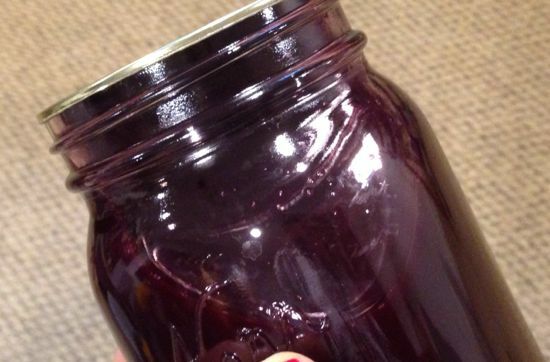 If the juice leaks when you swirl your jar, take off the lid, wipe the top, dip lid in hot water to clean it, and try again. A small leak is enough to prevent a good seal on the jar. I am steaming grapes today and the juice is delicious!! I tried your sealing method and it worked like a charm! Thank you. Christmas presents for my kids’ teachers are well under way. I’m going to add the corny tag, “I’m grapeful for you because…” to each quart jar and have my kids write a few words to each teacher. I place my lids and rings in a separate pan, boiling, and pull them out to set on jars to seal. Bottles in oven at 225*. I have never steamed the juice after sealing the jars. My extractor book says 45 minutes for grapes, you say 90, that seems like a big difference. What do you think? I always follow the book’s advice because that timing may be specific to your equipment. 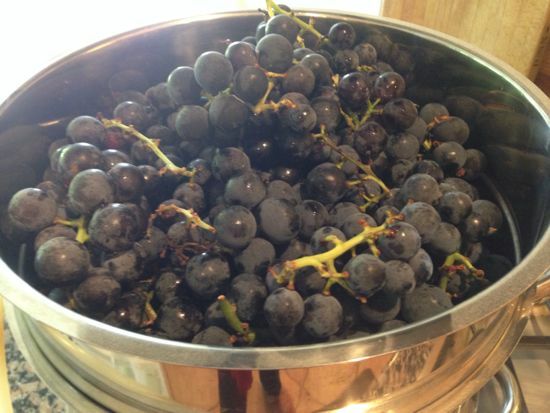 I did a bushel of Concord grapes today. Got 14 qt.of concentrate. We delute with 1 qt of water before drinking and sugar to taste. A steamer sure makes it simpler. I’ve had one for 35 years.